If you pre-order through that place that is not Barnes & Noble, it is being offered at 52% off the list price of $39.95. Do the math or just go order it. The offical release date is April 27, 2010. Here is the cover blurb and all the geeky details. 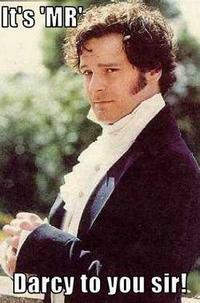 PRIDE AND PREJUDICE has taken its place as one of the greatest television productions of all time. The landmark adaptation from A&E and the BBC captured the hearts of millions by seamlessly translating the wit, romance, and intelligence of Jane Austen’s classic novel to the screen. With a masterful script, deft direction, and star-making performances from Colin Firth and Jennifer Ehle, PRIDE AND PREJUDICE transports viewers to Georgian England, where affairs of the heart are an exquisite game, and marriage the ultimate prize. But Elizabeth Bennet – spirited, independent, and one of five unmarried sisters – is determined to play by her own rules and wed for love, not money or privilege. Will her romantic sparring with the mysterious and arrogant Darcy end in misfortune–or will love’s true nature prevail? Now beautifully remastered for the ultimate in picture and sound quality, relive the timeless classic PRIDE & PREJUDICE on 2 DVDs. I feel a P&P 1995 Twitter Party calling. Thanks for the head’s up, LA. Darn, no closed captioning. I’ll still get it though. Thank you sooo much for sharing!! By the way, I liked the Sharpe’s Challenge! Is it with Toby Stephens? Hi Andriana, yes Toby Stephens is in it. It was filmed in 2006 so you may have seen it already. I haven’t. I am looking forward to it and Sharpe’s Peril on the following week. Technically you still would, since DVD can only reproduce 852×480 pixels compared to 1,920×1,080 in Blu-ray…unless of course you can find a film print. Yes of course MC. I was being overly dramatic. So excited about this new edition that I did not know what I was writing. Thanks for the clarification. I wonder how it compares to the Blue Ray? Will it be even better than that? I will most likely purchase it anyways. Three copies will come in handy, I’m sure. I not being over obsessive, right? You are my personal hero. It’ll be the same restoration, downcoverted to 852×480 pixels. Not possible. See the post above yours. I’m sure it’ll be a lot better than the previous DVDs. The colors were fixed during the restoration process. Since I still don’t own this yet (I know, I know….I’m a bad Janeite), I might actually take the plunge this time around! Thanks for the heads up, Laurel Ann. It’ll make a wonderful birthday present…to myself! LOL Blarneygirl. I burned through 2 VHS copies of P&P also before I bought the CD’s. The Special 10 year anniversary edition came with the book. The quality has not so good. Color was off and parts of the screen field cut out, so I was quite pleased to hear this was in the queue. Like you, I will have yet another copy of P&P 95. I will tell you a secret though, I am one edition up on you. I bought the Blue-ray edition last year even though I do not own a Blue-ray player yet. Now, that it sick! I do not have Blue Ray!!! hmph. A slight shopping accident occurred. Oops. Thanks for the information. Nothing like some nice Darcy in the lake to cheer one up! This is my favorite version of P’n’P. AND, I now have a Blu-ray player! WHAT? You can see my wish list? Is my name at the top as the person signed on also? What else can you see or do? Ack. Oddly enough, when I went to purchase it it gave me the option of sending it to you also! I thought maybe it was the link you posted that went to your account somehow, but it couldn’t have been that – I was logged into my own account. Weird. Ok folks this is freaking me out and have removed my wish lists from public view on the A store because I am affraid that one of my readers who clicked the link and bought it without realizing they are sending it to me! I did not even know that other online store that is not Barnes & Noble did that. One wonders how many buyers have sent stuff to others as gifts and not realizd it. Thanks for the warning BlarneyGirl! It’s amazing how much money the BBC can wring from this production! Not complaining, just amused. I’d been contemplating buying the Blu-ray version, since the quality is superior to the crappy DVD transfer that was previously released (which I did not buy). Glad to know they’ve restored it from high-definition sources for DVD, but I’ll probably go with the Blu-ray. I’m such a snob when it comes to digital picture quality. Haha! I will definitely be purchasing my 3rd version. I bought it when it first came out, then the 10 year anniversary version now I will get the digitally mastered version. I wonder why English is the only language? It came out in 2006 in Spanish on multiregional DVD, so the sound track is already completed. I might have been tempted to buy a third set had it included Spanish dialogue. Not all our friends here speak English -and I do love to share JA with anyone interested! My historical period does not go back quite as far as Austen’s, but I just wanted to mention that I’m currently reading a book called Readings On Jane Austen from Greenhaven Press–it’s not new, but it has some interesting perspectives, especially about how her view continues to open up as the times changed. Hmm. I have a copy of this but methinks I might have to re-invest. I need to see those individual droplets! Wow…this is so VERY tempting. Oh my! I must have one! And a Twitter party? Splendid idea! Laurel Ann – have you had a chance to watch this new release? I received it around the 29th and quickly popped it into my DVD player. The color difference is amazing and brought so much more detail into the scenes!! Dallas – yes I have received my copy as well and it is glorious. I will be reviewing it next week. It has been so long since I watched on TV that I forgot the difference. Only knew that the first DVD was too green and the anniversary edition washed out. So happy.